Thank you Waltham Citizens for Education for requesting a statement on the saga of siting a new high school. If any member of the group would like to host a coffee party I would certainly attend and address these issues and any others. This episode is a glaring example of what is wrong with our local government. Planning is suspect and it takes far too long to get anything done. Along the campaign trail I received countless questions regarding plans for the new high school and the Fernald. What is taking so long to site the new high school? Is the city ever going to do anything with the Fernald property? I will address these broad issues in relation to the specific questions regarding eminent domain and where we should site the new high school. Three sites were selected by the SBC and SC as the best options to build a new high school that met the needs of the strategic education plan: the current location, the Stigmatine property and the Fernald property. Unfortunately, two of these three locations are not viable. The city does not own the Stigmatine property and it restricted new school buildings for future use on most of the Fernald land when it was purchased in 2015. Planning for Waltham’s future needs requires foresight. The city has known for over a decade that it needed to either renovate the current high school or build a new one. Friendly discussions with the Stigmatine Brothers could have started earlier. Waltham has also fought for over a decade to obtain the Fernald property. Less than three years ago, the mayor requested City Council (CC) approval to purchase the entire 190 acres of Fernald land with Community Preservation Act (CPA) funds. Ultimately, the mayor, with overwhelming CC support, purchased 140 acres with CPA money and 50 acres with general city funds. A member of the CC at the time, I vocally opposed and voted against buying so much land with CPA funds and specifically cited that we may need the land to build a new high school. Using CPA funds restricts the use of land to open space / recreation, affordable housing and historic preservation and excludes building schools. Using general funds does not restrict the property use. However, the 50 acres which were designated by the Mayor to be bought with general funds has significant wetlands, topography issues, ledge, most likely environmental contamination, and historic buildings which all make the siting of a new high school, a significant problem. As a parent, I am extremely disappointed that the city eliminated most of the Fernald land as an option by purchasing it with CPA money and that it has taken so long to settle on a realistically viable site for a new high school. When my youngest son entered kindergarten, Waltham understood it needed to renovate and upgrade the high school or build a new one to meet today’s educational standards. Three weeks ago, this same child started school as a freshmen at Waltham High School. It is unacceptable for Waltham to not have a site determined at this date. During the past ten months since the SBC and SC first selected the current high school property as the preferred site for a new high school, several attempts to change the site location have only created unnecessary stress and division in our community. The rapid changing in site selection has been like watching a squirrel cross the road. These attempts have further delayed the construction of a new high school and jeopardized the $145 million in state building assistance. 1. The Stigmatine property: Separate CC approval is required to purchase and take private property by eminent domain. As I understand it, the Stigmatine property is not for sale. The CC is overwhelmingly against taking this property by eminent domain and has repeatedly voted against doing so. If the CC changed its mind, an unfriendly taking would take three years on average in court. To be clear, I am in favor of buying the Stigmatine property if it were for sale. I am philosophically against taking the property by eminent domain. Eminent domain is a police power that should be used sparingly with great care and only if there are no other alternatives. If there is another site option available (albeit not the best), an unfriendly eminent domain taking should not be considered. Side Note: I would have voted to expand the bond authorization to purchase the Stigmatine property from $18 million to $25.4 million as this was not contingent on taking the land by eminent domain. I also do not believe the request was out of order. 2. The Fernald property: Buying the Fernald with CPA money boxed in the city’s options. Reversing Waltham‘s decision to buy the Fernald land with CPA funds is another long shot. The CPA became state law twenty years ago and is funded with local and statewide taxation. Communities must vote to adopt the law in order to receive matching state CPA grants. Waltham voters accepted the CPA with its use restrictions in a special election. Communities can opt out of the CPA or alter the taxation rate but cannot disobey the state law. In fact, no community has attempted to change the state law in order to allow use of the expended CPA funds for a restricted use. The statewide Community Preservation Coalition has said it will fight any attempt to undue the CPA and therefore Waltham’s recent decision to use CPA money to buy the Fernald. This is a state-wide issue as opposed to just a local concern. Every legislator in the state has constituents that would fight the alteration of CPA use and the integrity of the CPA law. In addition, Waltham would be required to replace open space used at the Fernald with land not already preserved elsewhere in the city. Over the last 10-15 years, Waltham has purchased and restricted the use of large tracts of land for open space. That land could not be used in a swap. For years, I along with the Fernald Working Group and others, have called for a community driven, comprehensive asset assessment and reuse plan for the Fernald land. If this had been funded and implemented, the Fernald would have been properly vetted and community consensus on reuse arrived at. Mass Historic Commission (MHC) approval would also be required to use or demolish historic buildings on the site per a Memorandum of Agreement signed by the mayor and enforceable by the MHC. This takes time to consider and Waltham has yet to submit documentation requested by MHC to make any determinations. Finally, Waltham was able to buy the 190-acre site for only $3.7 million because the city bought it as is. In other words, Waltham is responsible for any environmental cleanup required. To the best of my knowledge, in the nearly three years that the city has owned the property, it has not sought to formally locate, determine the cost and existence of environmental issues on the property. Side Note: The city never registered the purchased Fernald land in court. Some believe the configuration of land could be adjusted by the mayor by moving the 50-acre, general fund bought land away from historic buildings and likely environmental hazards. This would avoid the politically challenge changing the CPA law. It would also allow a new school without MHC and legislative approval. If this is true, I would support doing so. 3. Veterans Field: Placing WHS at this site would create severe traffic and safety problems, while destroying expensive athletic fields and displacing the popular youth soccer league. In addition, it would take a new memorandum of understanding between federal agencies or literally, an Act of Congress to approve an educational use for that property. I do not support utilizing this location for a new high school. The root cause of this mess is poor planning. For over a decade the city has known of the current high school building short comings. For years our student population has been rising. Exhaustive and thoughtful efforts have been made to design a school that best meets our students needs. Despite all of this, leadership has failed to nail down a location. At this time, pursing the Stigmatine or Fernald property for a new high school are long shots at best which would add unknown years to the project. They are not viable locations. This leaves one site chosen by the SBC and SC which is only thirty feet from where my child, a freshmen and thousands of other students are attending Waltham High School. Do I want a new high school built adjacent to the existing high school my child is attending? No. 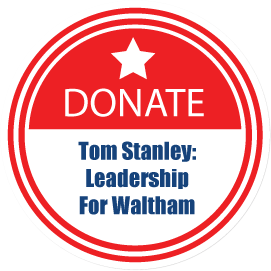 But at this point, I don’t know where else it could go without putting another generation of Waltham students through sub-standard educational learning conditions. It is time to stop the nonsense and get the job done.